One of the main services that PGF Caravan Services carry out is the caravan habitation service. In this is a popular service, especially near the colder winter months when caravan owners are putting their caravans away into storage. 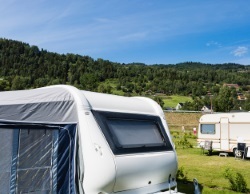 Before you put your caravan in storage, it is vital that a caravan habitation service is carried out in order to ensure your caravan is okay to be stood in one position for a prolonged period of time. In particular, you want to be confident that your caravan will not attract damp while in hibernation, so the caravan hibernation service is perfect for this. With affordable prices and trustworthy results you can feel confident that your caravan is in safe hands with the team here at PGF Caravan Services. In some cases, manufacturers need proof of habitation services and other checks to keep within the warranty, if in doubt please contact your warranty provider. Although some forums can suggest carrying out the caravan habitation service yourself, it is important that a professional reviews the checks to ensure reliability and safety. That is why we keep our prices low and affordable, so that everyone can use our services when needing regular checks rather than relying on their own judgement. To arrange your caravan hibernation service in call 07805 000 612 or 01452 553 288.